Alan Cockrell wrote a book about his C-141 experiences. It's worth locating if you are a real C-141 junkie. Link to Alan's web page. for more about this book. Tail of the Storm by Alan Cockrell. When Saddam Hussein's army invaded Kuwait in August 1990, precipitating US intervention to free the Arab emirate, few people in national policy-making positions could accurately envision the complexity of fighting a war seventy-five hundred miles from American soil. In particular, the difficulty of supplying war fighters in-theater was probably imperceptible to most people. But the logistics tail from the United States to Saudi Arabia--the point of embarkation for most military operations during the war--moved millions of tons of equipment, supplies, and personnel; represented one of the most crucial aspects of the conflict; and eventually provided US forces with the tools for victory. 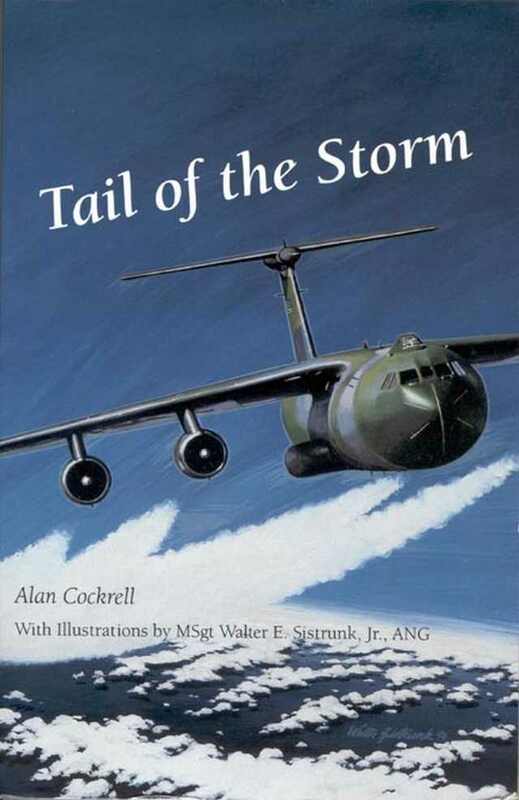 Alan Cockrell, a command pilot who logged almost one thousand hours as an aircraft commander during Operations Desert Shield and Desert Storm, uses the logistical "tail of the storm" as a framework for chronicling his keen affection for flying and airplanes in this very readable, humorous, and insightful view of military transport aviation during a time of national crisis. He accurately captures the balance of purpose shared by most military aviators: a broad sense of duty to country and a more selfish passion to slip "the surly bonds of earth" for personal satisfaction. Cockrell punctuates his work with personal stories encompassing his 20-plus years as a pilot in which he flew private aircraft, tactical fighters, and heavy transport aircraft for himself, the Air Force, the Air National Guard, and a commercial airline. These poignant vignettes from the cockpit and military facilities around the world expose the human aspect of military aviation. In one episode, Cockrell brings life to the complex emotional and logistical demands of a trans-global C-141 mission from the United States to the Kuwaiti theater. He illuminates the fraternal spirit, crew members' practical jokes, inefficiencies and inconveniences endured, humorous and terrifying experiences in the cockpit, as well as commentary on current issues such as female pilots in the Air Force. Also revealed are the personal consequences paid by airmen who pursue their dreams, such as displacement from family, jet lag, never ending "bag drags," and, occasionally, the death of a comrade. Perhaps the most engaging aspect of the book is the way Cockrell consistently praises the professionalism and talent of the men and women--both enlisteds and officers, fliers and non-fliers--with whom he flew. The book is filled with nuances of the teamwork and family that motivate everyone to endure--even in the face of danger or, worse, boredom and stupidity. Cockrell shares personal stories of how misguided fervor in the cockpit can quickly translate into death for an unwise or unsuspecting pilot. He recounts how he tried to prove his tenacity to the wing director of operations by attacking a practice target at high speed, low altitude, and with great bravado but without proper planning and target acquisition. The result was near death in a fiery crash of his A-7 as his wingman looked on. Another story involves a genre of frustration that all crew members endure on long missions. In this case, the commanding general learned that hotel rooms at Torrejon Air Base, Spain, were reserved for Air Force Academy cadets, while visiting aircrews had to sleep in the base gymnasium. According to Cockrell, the general "proceeded to clean out the temple." These and other examples highlight the illogic that seems to haunt all large bureaucracies. Cockrell grabs the logistical tail and parlays it into an entertaining and realistic account of the magnitude and limitations of supplying a distant war. As a bonus, it is also an agreeable, personal memoir that merits reading by fellow aviators and aviation enthusiasts alike, because it provides a vivid and coherent account of the trials and tribulations of those people who flew in the Tail of the Storm.